Description: Booklet with soft covers. The upper and lower sections of the cover page are orange. 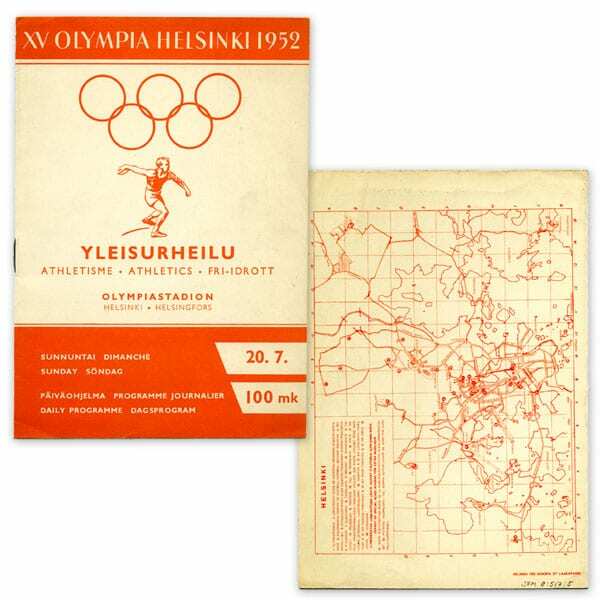 The white middle section features the Olympic rings, a discus thrower and the texts: YLEISURHEILU; ATHLETISME ATHLETICS FRI-IDROTT; OLYMPIASTADION; HELSINKI HELSINGFORS.SUNNUNTAI.PÄIVÄOHJELMA 20.7. 100 MK. 15 pages. The map of Helsinki in back cover. Other information: The programme for the track and field athletics competitions on 20 July 1952. 54 different programmes were printed: 33 day programmes of major individual sports, 11 competition programmes of minor individual sports and 10 tournament programmes of team sports (football, basketball and field hockey). All were sold for 100 Fmk. The programmes were printed in Finnish, Swedish, English and French. They also contained useful information for tourists, such as a timetable of Olympic competitions and a Helsinki traffic map.